Being of the Laity and never feeling worthy to be a priest, Philip Neri desired nothing but to serve as a lay man. He had been preaching in the hospitals, then on the street corners waiting for the office workers to leave for lunch or home. He would speak to them, instruct them with the true teachings of the Church. He taught with such love, such fire that more and more came, and stayed longer and longer, until they began following him, visiting the poor and the infirmed; and the Confraternity of the Laity was formed! The Confraternity was not only filled with these young people, now on fire for the Faith, but with the nobility. The Apostolate took on the care of poor pilgrims coming to Rome for the Holy Year. Since most of them arrived sick, tired, without much to eat, having walked hundreds of miles under the worst conditions, they had need not only of a place to stay, but often a hospital. St. Philip and his Confraternity set up the first pilgrims’ houses in Rome, where they could stay a short time, convalesce or receive more intensive hospital care. The time came for Philip Neri to become Father Philip Neri. His confessor convinced him he could do more good fighting the heresies and paganism destroying the very fiber of our Church and the Mystical Body of Christ, as a priest. He obeyed! He was ordained at thirty-six. His first Mass, he became so overcome with emotion, shaking almost uncontrollably, he could barely pour the wine and water into the chalice. At the moment of Consecration, when he elevated the Host, he had to lean against the altar for support, as he feared he would fall over if he did not brace himself. This would repeat itself at every Mass he said. He was never too sick to celebrate the ongoing Sacrifice of the Cross every day. He united himself so deeply with the Lord, His last hours on the Cross, that at the moment of elevation, he would levitate, suspended over the altar for more than two hours. For this reason, toward the end of his life, in order to not attract attention to himself, rather than to the Mass and what is truly happening on the altar, he celebrated Mass privately in a little chapel adjacent to his room. His first biographer said he came upon St. Philip many times, elevated as high as six feet from the floor while saying the Mass. One day, during the celebration of the Sacrifice of the Mass, as he was supplicating Jesus to give him the gift of patience, he heard an inner voice say, “You’ll have it; the road to Heaven is through the Cross.” The Lord was to soon show him the meaning behind his words! Father Philip Neri went to live in the Church of San Geròlamo where he was persecuted by two bishops who inflicted the cruelest insults upon him, accusing him of deserting his family and the responsibilities connected with his former title and birthright. He bore it all with humility and patience. He continued to preach, but now not only from the pulpit but from the confessional. During the forty hour devotions, which he loved, he preached so passionately about the God-Man Jesus Who was alive in the Monstrance that one day there were thirty conversions, young men who had come to church to ridicule Father Neri and disrupt the Mass, but after hearing him, converted and asked to go to confession. More and more people returned to the Sacraments after many years away from the Church. He began teaching in his private chamber; from this, more and more came, and before you know it the Congregation of the Oratory was formed. Philip Neri was thirty seven years old. The Church is under siege, and the heretics are attacking the very lifeline of the Church, the Sacraments. How does St. Philip Neri respond to this abuse? He begins to preach on the necessity of receiving the Sacraments: The Sacrament of Baptism soon after the birth of a child; The Sacrament of Confirmation, the final initiation into the Church – the Sacrament which calls us to become Soldiers of Christ; The Sacrament of Extreme Unction, the merciful last kiss of the Church; The Sacraments of Reconciliation and Holy Communion and the need of frequent reception of these Sacraments to be strong; the awesome sanctity of The Sacrament of Holy Orders; and the sacred union between husband and wife and Jesus the day they are united under the Sacrament of Matrimony. His sermons attracted so many to the Sacraments, he often had to hear confessions into the wee hours of the night, sometimes ending with the rising of the morning sun. But he was so happy! Never too tired, he would wash his face, maybe catch a couple of hours of sleep and off he would go to the confessional to hear more hearts cleansed of their sins returning to Jesus. Philip Neri had all the gifts; one of which was the ability to read men’s hearts. When a penitent needed help making a good examination of conscience, and was struggling during confession, Philip Neri would reveal the penitent’s most hidden, innermost sins, and with that helped the penitent to make a good confession. Philip Neri heard the call to go to India as a missionary. He immediately asked to go. The answer was: “Your India is Rome; it is to the Romans you are to bring the Word of God.” Although disappointed, he obeyed! Philip Neri went after heretics with love but also firmness. No heretic was safe around him; the hardest hearts were softened and accepted Mother Church as the one True Church. There was a heretic who was awaiting being burned at the stake, as this was the punishment for heresy by the state, at this time. Nothing or no one could persuade him to renounce his errors and ask pardon of Mother Church. He obstinately refused all pleas made to him to save his life and immortal soul. He would hear nothing of it. Enter St. Philip! After he spoke to him gently and lovingly, the heretic repented, retracted publicly his errors and asked pardon of the Church; as a consequence he was saved from death. St. Philip Neri expelled demons! As Persiano Rosa, his confessor was dying, he was attacked by the devil who appeared in the form of a black dog. As soon as Philip Neri entered the room, Rosa asked him to pray for him. No sooner had Philip Neri knelt and begun praying, than the prince of hell fled, howling in anger and mortification. The Carnival and its perversion enveloped and swallowed much of Rome’s society, the rich and the poor united in its debauchery. 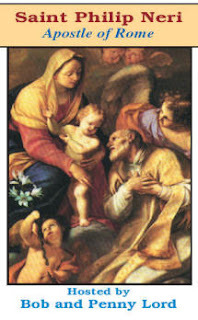 Philip Neri came up with a solution: He instituted the visitation of the seven churches of Rome, to be done during the Carnival. First members of the Confraternity processed; then others joined, first out of curiosity and then desire. As holiness is eternally beautiful, and evil everlastingly ugly, the young, tired of the depravity of the Carnival, were attracted by the solemnity of the procession and processors; soon more and more joined the holy parade to the seven churches. Like Jesus, Father Philip Neri was always calling God’s creatures to be as He had designed them to be, not as the world had refashioned them. He asked Fiora and some other penitents to take in orphans, clean them up, feed them and teach them how to live holy lives in the world. Charity toward all, his heart bled most for the poor and the sick. One day, as he and one of his Confraternity were passing by the Coliseum, he came upon a person lying in the street, more dead than alive. The man called out, “Do I revolt you?” Father Philip Neri’s response was to ask his spiritual son to lift the man and bring him to their hospital. The work of the Council of Trent continues! We oftentimes think the Lord doesn’t let one or two people do everything in Salvation History, because then there would be nothing for us to do except follow what has been passed down to us. The Lord wants us to feel a part of things. Well, here we have the next Pope taking the torch, so to speak, from his predecessor, and running with it. It was crucial that the right man be chosen, who could take the work of Pope Pius IV, and bring it to conclusion. All the work of the years before, since 1521, would be culminated in not only the decrees of the Council, but even more difficult, having those decrees implemented and enforced. It would take a strong man to do that. The man whom the Lord chose to continue the work of the Counter-Reformation was a brilliant man who was able to be molded into a Saint. He became St. Pius V.
Pope St. Pius V, was born Michael Ghisleri in a little village in the Diocese of Tortona near Alessandria in northern Italy in 1504. He was a firm believer in the Truths of the Church. He embraced the Dominican Order at age fourteen and entered the Seminary. From the beginning of his days in formation, it was obvious to all his superiors that he was chosen far above the rest. The Dominicans knew he would go far in the Order, do great things for God and advance the rule of his Father-in-Faith, St. Dominic Guzman. He did move ahead as his superiors thought he would, assuming the posts of lector in Theology and Philosophy for many years. He also served as novice master and in the governing houses of the Order. He did well as a Dominican. St. Dominic would have been extremely proud of him. He was sent to the Dominican convent in Pavia, near Torino. He was for many years second only to the provincial of the Dominican order in Italy. In 1550, he was given a difficult task, that of inquisitor at Como, which borders Switzerland. At that time, it was a hotbed of Calvinist insurgents. His methods of operation caused him to cross swords with the bishop’s vicar-general, who thought he enjoyed his job a bit too much. However, it also brought him to the attention of Cardinal Carafa, who would later become Pope Paul IV. Now Cardinal Carafa was a member of the Inquisition in Rome. His philosophy was akin to that of Ghisleri, the young priest from Como. At a time when enemies were more plentiful than friends, he embraced the young priest. He saw in him firmness of purpose and purity of faith. He was Church; and he projected Church to all he met. As the Dominicans had seen his potential, so had the rest of the Church, especially Cardinal Carafa. After he was elected Pope, he consecrated Michael Ghisleri Bishop of Sutri and Nepi in 1556 at fifty two years old. A year later, Ghisleri was given the title of Cardinal. He took the name Cardinal Alessandrino, after his city. While this was a great honor, it also took him away from the Dominican Order where his heart was, because his duties had to be now focused on the dioceses of which he was in charge. He was a very humble man, and would rather have spent his time praying and writing prayers to be used by others, whom he judged more capable of bringing the Church into the last half of the Sixteenth Century, without losing any more brothers and sisters to the Protestants. Keep in mind what some of his concerns were. His diocese was just south of the Swiss border. Calvin had made enormous strides in Switzerland, and was sweeping into Italy from the north. France was on the west, not that far away. The French Calvinists, who were called Huguenots, were more vicious in their attacks on Catholics than Calvin, if that’s possible. No, that’s not possible. No one was worse than Calvin, with the possible exception of Elizabeth I of England, illegitimate daughter of Henry VIII and Ann Boleyn. But as a Cardinal and Bishop, you can understand his concerns for the Church at large, and his diocese in particular, being right smack in the middle of the problem, and being the head of the Inquisition for the Italian provinces on the Swiss border. Remember, he was a Dominican. Dominicans had been in charge of the Inquisition all over Europe from the time of St. Dominic. It was an honor, surely, but it was also a major task. To add more burdens to his job, he was made Grand Inquisitor for life. Cardinal Alessandrino was not someone who would go quietly in the night. To the contrary, he was a bold, solid person when it came to the rights and wrongs of his Church. And he didn’t care if he ruffled the feathers of Popes, which he did, or rulers of countries, which he also did. He found himself the recipient of many criticisms from Pope Paul IV, who had been his mentor, his kindred spirit, on more than one occasion. Then when the new Pope Pius IV, the diplomat, came into power, he was again rebuked. You must understand that he was not a diplomat! He was not on good terms with monarchs who were allowing heretical groups to breathe down his neck from two fronts, France and Switzerland. Also, Cardinal Alessandrino would not back down from the Truths of the Church, especially in his position as Grand Inquisitor, even if it meant upsetting one of these monarchs, or, unfortunately at times, even his Pope. By the time Pope Pius IV died in 1565, relations between him and Cardinal Alessandrino were strained, to say the least. There was even a point in his career when he just wanted to give up his various jobs and go back to his bishopric in Piedmont to live out the end of his career in peace. He had a problem getting back to Piedmont, however, when he took ill and had to recuperate in Rome. Again, this was another area of contention between the Pope and many of his bishops and cardinals. Even the Pope’s nephew, St. Charles Borromeo was against it. Cardinal Alessandrino was against bishops living in Rome, which he made no bones about, but which estranged him from the Pope. We know it has to be pure Holy Spirit that Cardinal Alessandrino was unanimously elected Pope in only nineteen days after the death of Pius IV. More ironic is that the major force promoting him for Pope was Cardinal Charles Borromeo, nephew of the Pope (Pius IV) with whom Cardinal Alessandrino had so much trouble. St. Charles recognized in Cardinal Alessandrino the strength which would be needed, not only to bring the Church through the problems with the Protestant Reformation, but the Moslem dilemma, which we haven’t even addressed yet. St. Charles also was given infused knowledge that this man would be able to get the Council of Trent back on track and brought to its conclusion. He was right on all counts. On January 7, 1566, he began his Pontificate as Pope Pius V. The world would know him as Pope Saint Pius V a hundred and fifty years later. This area of Italy has brought us many holy people, including Don Bosco, Dominic Savio, Aloysius Gonzaga and Pope St. Pius V.
Read about St. Dominic in Book I of this series, Journey to Sainthood. As Pope Pius V, he would excommunicate Elizabeth I of England on February 25, 1570. You are currently browsing the archives for the Defenders of the Faith category.